I firmly believe that the best way to acquire new vocabulary is to hear it or read it, in context, in multiple contexts, many times. So, personally, I read in Spanish whenever I have the time. I rarely read fiction in English. This year I’ve been really in to Isabel Allende’s Zorro and Inés del Alma Mía and García Marquez–specifically, Noticia de un secuestro, and now I’m reading Amor en los tiempos de cólera. Along that line of thinking, my Spanish 3 students also read. I dislike asking them to read/view things that are decidedly American (especially WASP American) that were translated into Spanish. If we’re really dedicated to all the 5 C’s, we need to include stuff that’s culturally rich and relevant. 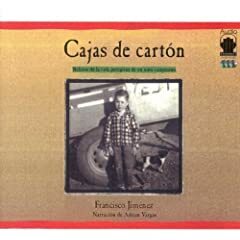 So, in the fall of Spanish 3 we read Cajas de cartón, Francisco Jimenez‘s story of how he came to the U.S. as an illegal child immigrant with his family in the 1950’s. The students take a quiz over each chapter as the semester progresses, and then once a quarter I add up the grades for a test grade. In case anyone might find them useful and/or have constructive comments, I’ll probably upload my quizzes for the book soon. So far I’ve only written them for chapters 1-5.